Paytm is turning out to be largest virtual cashback in India as many of us are using it for numerous purposes in our day to day life. In the recent update, Paytm has added send money to contacts directly through Phonebook on Android. The latest update has come up where Paytm allows users to send Post Cards on iOS and Android versions of its app. With this users can send Post Cards to their loved ones with a customised and personalised text messages. Aside of above mentioned feature, Paytm also introduced Paytm Automatic by which one could easily top up Paytm wallet balance. On Android, Paytm App's version 5.10.0 update and on iOS 5.11.3 update will lets users to use Postcards and automatic top-up options. Users need to open Paytm app and head to Postcards option. Click on Send a Post Card option to send customized text messages to their loved ones. Choose Mobile number from the contacts or enter a one. Paytm users can further enter the amount they want to send and finally select the contact and write message of their choice along with the design of the post card. 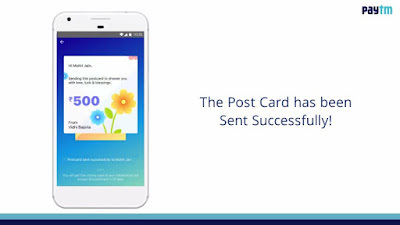 If the contact does not accept the post card within 10 Days, users will get the refund of their entire amount. Paytm has noted on appstore as "Now you can send gifts, wishes and blessings to your friends and family through Paytm Postcards. Why bother about gifts when you can send them Paytm Cash, that too with custom themes and message. On opening a postcard, the sent money will automatically be added to receiver's Paytm Wallet balance. Start exchanging Paytm Postcards now. Wait for the next update and see how much fun you can have with the Postcards!!" Paytm Automatic is the latest feature which is now only available on Android app. With this feature, Users can set a particular amount as a recharge whenever the balance dips below the minimum. Paytm Automatic is a option where the users will be able to fix a particular amount as a minimum balance for the wallet. The required or minimum balance amount will be added to once account once in a day and if the wallet balance exceeds the monthly usage limit, the amount will be added to next month. Automatic Payments will be now much more flexible as Android users can check their Paytm order summary screen when they recharge or pay a bill to enable automatic payments through the app. Paytm Automatic feature will make its way to the iOS version of the app in around three weeks. Paytm Automatic :- Tired of remembering to recharge before you run out of talk time? Now we’ll do it for you. 1. Place a recharge order at Paytm.com just as you do usually. Once your order is successful, you will see the Auto Recharge Option. 2. Click on the dropdown to select the preferred repeat recharge duration. 3. When you proceed, you will be asked your preferred mode of payment. You can select a credit card or Paytm Wallet. Please note, by default we will always debit your wallet first. 4. In case you plan to add a credit card, Re.1 will be charged to your card to authenticate this card. This Rs. 1 shall be automatically added to your Paytm Wallet. 5. As soon as you pick your payment mode, our system will schedule a recharge for the same amount as the first order after a duration selected in the drop-down. Happy Recharging!